Originally posted by Kevin Jackson to Cop-Reports.com. I was walking down S. Kihei Rd. in Kihie, HI. when I noticed a truck pulling in to the Rodeo General Store with several unmarked MPD vehicles pulling in after him. With recent events and the known corruption of the MPD, I began to record the encounter. I began by recording the truck, all of the MPD vehicles and their tags. At first, the police did not seem to mind me filming and adding audio comments. I then began to describe the attire of the MPD as “militarized.” About then, I began to engage with the driver being cited for what I believed to be his tires being too big. I began to instruct the driver of what he should say, establish he was not free to leave and invoke his rights. I also instructed the driver not to let the police search his truck. This is when the MPD began to worry about my encounter. The next thing I know, the security guard asked everyone to please leave the property while the police conducted their investigation. I immediately left the property without any confrontation as asked (noted in the police report). 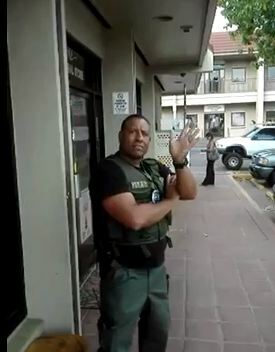 I then stood on the public sidewalk and was approached by an unidentified officer and was told that I was not allowed to stand on the sidewalk because I was blocking it. At that time, I stood on the grass between the sidewalk and the road making sure I wasn’t blocking either. Then an unidentified officer told me that I was causing traffic to slow down and that if anything happened, I would be charged with disorderly conduct. I continued to communicate with the driver and by this time, a larger crowd began to gather. I was stating that the officers were breaking the law themselves as they were “enforcing private laws on public property.” This is about when I was approached by the arresting officer stating that my actions were causing alarm to the security (which is not a member of the public as required by the statute) and I was being arrested for Disorderly Conduct. I was then searched, handcuffed and taken to the Kihei Substation for further processing and released after giving them a ransom of $100. I went to court in July and the DA declined to press any charges because the charges were trumped up, bogus and did not meet the requirements of the statute. I was silenced and nothing more. My free speech was violated when I began exposing the fraud of the police. There are 3 parts to this video series on Youtube. 1, 2, & 3. I am planning on filing a federal complaint against the MPD, the several officers, Maui County, The Chief of Police and The State of Hawaii. I have the complaint typed up and the federal civil cover sheet. I have added up the total of the violations and came up with $18,000,000 in civil violations. I’m waiting on an attorney to review my complaint to make sure the i’s are dotted and t’s are crossed.